Situated amidst beautiful open fields and woodland, the Glebelands Park development features a collection of detached and semi-detached three, four and five bedroom properties, designed to offer stylish homes that blend in to the surrounding countryside. 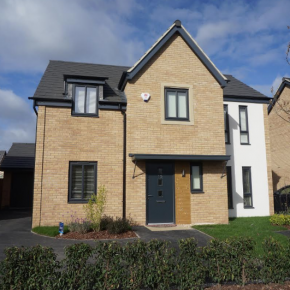 Morris Homes chose Dark Grey fascia to ideally complement the grey window frames, juliet balconies and garage doors, achieving a coordinated, contemporary look. Phil Shaw, Procurement Manager, talked about Glebelands Park, which he described as one of Freefoam’s more ‘contemporary’ sites. “We’re often driven by planning guidelines and pride ourselves on being able to offer Local Authorities a ‘non-standard’ look that will enhance the local area. One of the ways we achieve this is by using colour instead of white. It immediately raises the profile of a house design and gives instant kerb appeal,” he said. Colour fascia, soffit and guttering is manufactured using Freefoam’s patented ColormaxTM technology; an advanced master-batching process with a blend of natural PVC and pigments that are simultaneously co-extruded. Richard Watson, Site Manager, went into detail about how it worked: “With 100 homes planned for the development we needed to be confident that the roofline materials would be consistent and available when needed. Colour has rapidly become one of the major design changes in both new housebuilding and retrofit in the past five years; house builders like Morris Homes are increasingly using colour to bring style and definition to developments. Freefoam Building Products are an established expert in colour and have put in place manufacturing and ordering processes to meet customer expectation and deliver customer demand.